Still working on the tamale course, I needed to take a break, and asked where to find the bathroom. Following the directions upstairs, I found myself with several rooms to choose from, each separated from the hall by a thick curtain. For no particular reason I picked door number two and swept open the curtain. The young woman sitting on the toilet five feet in front of me scrambled to cover herself with a handful of toilet paper, but the damage was done. I exclaimed, backed gingerly away and waited nervously across the hall. When she emerged, I gestured toward my heart with both hands and said earnestly: ¡Estoy tan embarasado! She seemed to accept my apology graciously, which must have been really hard for her, since—as I later found out—I'd just managed to forget about one of the most notorious false cognates in Spanish, and had exclaimed "I'm so very pregnant!" I'd just managed to forget about one of the most notorious false cognates in Spanish, and had exclaimed "I'm so very pregnant!" The parents of the groom, sitting near us, were presented with even bigger bowls—each the size of a large casserole, filled with what looked like half a turkey! The mole, with its complex blend of flavors, was very good, but none of us could even begin to finish such a portion. Apologizing, we were told not to worry; soon big plastic buckets were passed around and everyone just dumped in their leftovers. They offered us one of the buckets to take home with us, but we deflected the generosity to others whom we suspected would be far better able to use the food. Now that it was dark, the mariachis wrapped up their gig and joined the party. Huge speakers and portable banks of equally loud colored lights had been installed right outside the dining area, under another big tarp. An endless flow of recorded popular and ranchero music started to blare, and people began to dance. We'd heard somewhere about the wedding fiesta tradition of dancing with goats or turkeys, which then would be slaughtered for dinner. We'd heard somewhere about the wedding fiesta tradition of dancing with goats or turkeys, which then would be slaughtered for dinner. (This, I guessed, might be a remnant of Mayan or Aztec sacrificial offerings.) 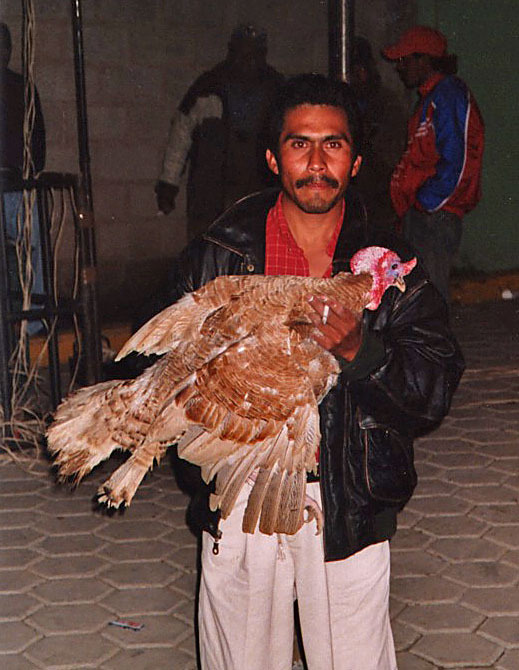 Sure enough, after an hour or so of dancing, the floor cleared and four older men (I suppose they were the village's elders) walked out, each holding a huge live guajolote (turkey) in his arms. 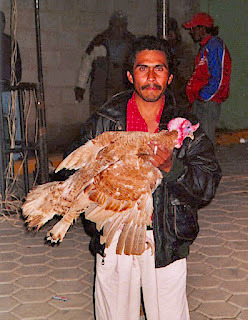 A simple, rhythmic music started and each man danced with his turkey. It was a plain, elegant dance, just stepping, moving and turning with the music, and both the men and the spectators (and the poor birds for that matter) seemed subdued, even reverent. By this time, I'd had several beers and probably five or six tequilas. I was honestly beginning to believe that the people I'd been trying to converse with could understand me and vice versa. While waxing more and more “fluent,” I looked up and suddenly there was a turkey in my arms. Apparently one of the men had singled me out as the "elder" of our group. Before I could object, I was being pushed by the crowd out on the dance floor and did the only thing I could: I danced with a turkey. The bird was surprisingly docile, given what must have been, for him, the otherworldliness of the situation. 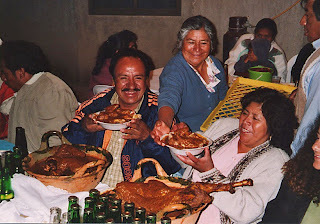 There I was, with the other three men, being watched by half the village, and the reality of the situation broke through the fog in which the tequila had shrouded me. While I was very much in the moment with the sensation of the warm, damp feathers on my hands and arms, I also felt a transcendent sense of peace and contentment as I let the both the music and my emotions move me around the floor. Then a very conscious thought rose through the raw motion: a prayer that I would never forget this magical moment. Eventually, the loud music and less serene dancing returned, and the turkeys disappeared. A few minutes later, four young men crossed the dance floor, unceremoniously carrying the now limp bodies of the big birds by their necks. But, since everyone already had eaten dinner, I was left wondering what became of them. Still in my reverie, I never thought to ask. After the turkey dance, people seemed to look at me differently, with approving smiles, I thought. I did my best to engage in small talk, but couldn't make out much of what they said above the thunderous music and my re-thickening fog of inebriation. About midnight, we decided that, after such a long day, we'd find the hotel Silverio had booked for us along the road back to Puebla. But one of the wedding couple's relatives wouldn't hear of it, insisting we stay at his home. So we got our bags from the van and ambled off with him down the street. The music abated long enough for an even noisier round of fireworks. The house was relatively nice compared with most of the working-class Mexican homes I'd seen, with several sparsely decorated, apparently unused, small bedrooms. Kip and I shared one of them. The beds were quite nice, with decent mattresses, but, as in so many Mexican homes, the room cringed under the harsh light of a single bare bulb. Just as we'd settled in, turned out the light and closed our eyes, the music started again at the party, blasting as if it were coming from the next room. At the same instant a deafening aerial bomb went off, rattling the few religious trinkets decorating the walls. Kip and I both burst into laughter at the amazing experience...and the obvious futility of trying to sleep. A wonderful story! So visual - I can see the small village and hear the sounds of the wedding and excitement of the villagers. Thanks for your comment, Angela. It means a lot to me to know you stop by here now and then! Indeed, it was an experience that left an imprint on all my senses. I'm sure you have some such to share yourself, no? Are you headed for Zihua any time soon? People always ask us...why do you always go back to Mexico. Isn't always the same old thing / beach resort?? Plus the crime....! Great story & very well written. Sums up why we keep going back. Hey Alaska - Mexico's an addiction for us too! Where do you like to go? As you suggest, we've seldom had any memorable experiences anywhere near a beach, and have never been directly affected by any crime. Thanks for the comment - hope you'll come back and share a link with friends!